Nevertheless, since there is a serious lack of Asian restaurants in my neighborhood, Panda Express hits the spot whenever I'm too lazy to cook and need my Chinese food kick. Compared to other American Chinese restaurants in the area, Panda Express beats down the competition because they use really fresh ingredients and, due to the restaurant's popularity, their food doesn't tend to sit around for too long. More often than not, there's usually a line around lunchtime or dinnertime. They must be doing something right. What I think they're doing right is their frequent introduction of new dishes so as to keep their customers' interest. Earlier this year (around April I believe), they introduced a dish called Shanghai Angus Steak. It has since become one of my favorite items to add to my plate, however, it costs a couple dollars extra. I decided to recreate my own version at home. Kecap Manis, available at most Asian grocery stores. Add the cornstarch and 1 tbsp. 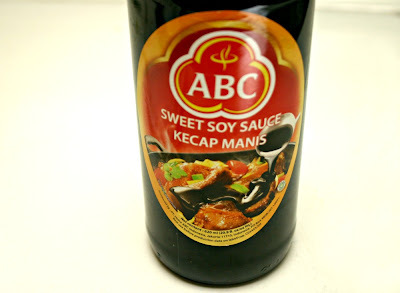 soy sauce to the beef and set aside. Allow to marinate for an hour or up to two days in the refrigerator. 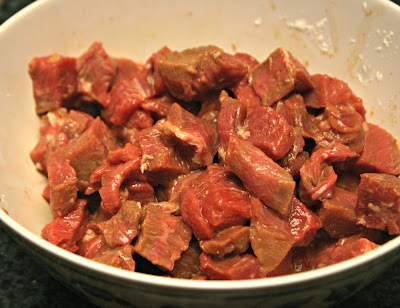 This process tenderizes the beef and also thickens the sauce later. Heat a large skillet or wok over high heat, add the sesame oil until it smokes then add the garlic and onion. 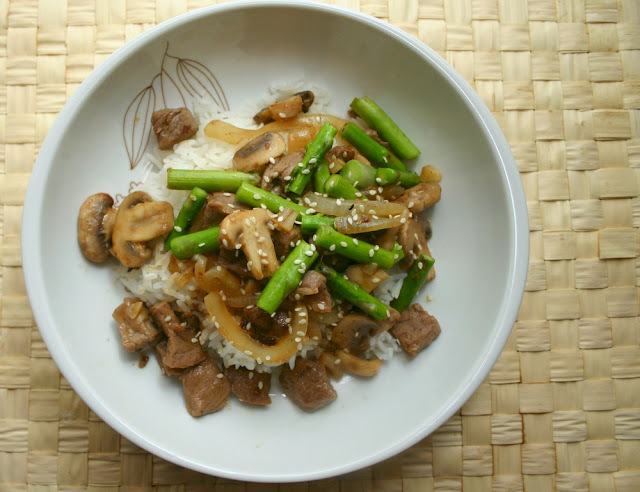 Stir fry for a minute then add the mushrooms. 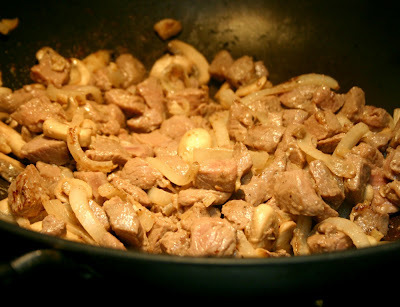 Stir fry for another minute or two then add the beef chunks. Cook the beef until no longer pink, about 5 minutes. Add the asparagus followed by the rice wine. 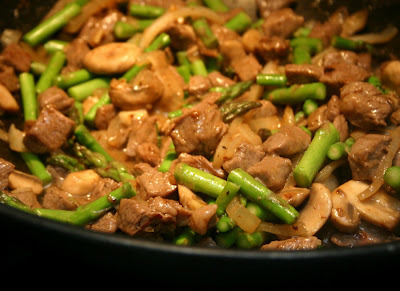 Stir fry for another minute. Finally, add the sauce mixture. 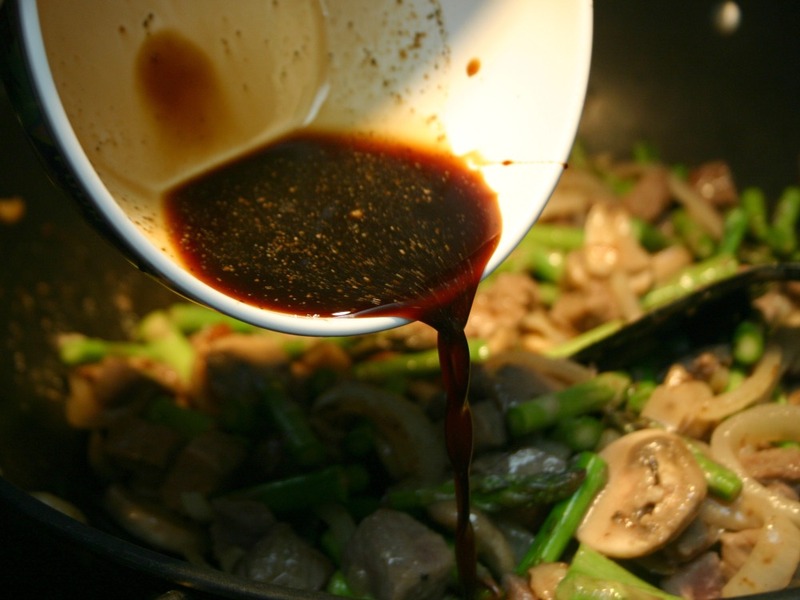 Cover the skillet or wok with a lid and allow the ingredients to cook together for a few more minutes. Make sure the asparagus is not overcooked. It should be just crisp tender. When the asparagus is ready and the sauce has thickened abit, remove from heat. 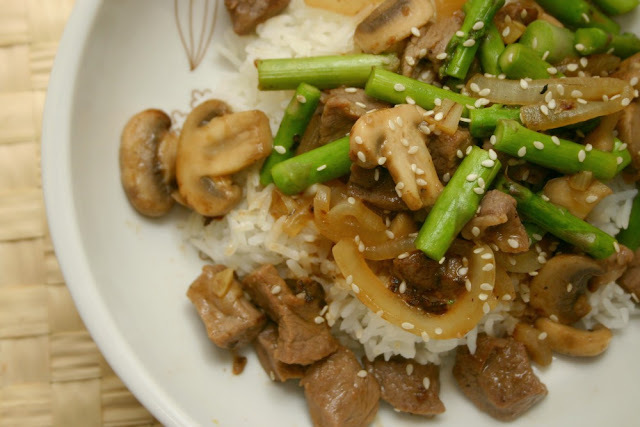 Serve over white rice and top with sesame seeds if you so desire. 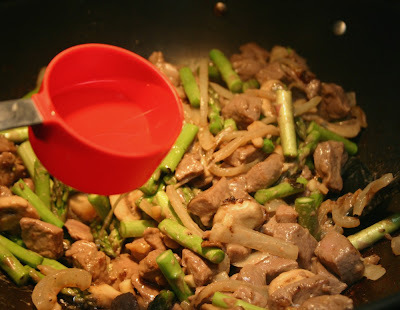 And there you have it, my version of Panda Express' Shanghai Angus Steak recipe!